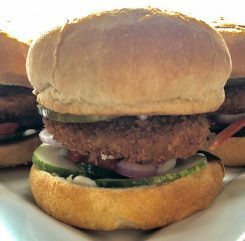 Here’s a recipe from producer Holdeman Poultry. Holdeman Poultry is family owned business. We started raising Capons in early 2012. These chickens are minimally processed with no fillers or additives added.For those of you that are not familiar with Capons here is little info. Capons are a very old tradition. Many old timers will remember raising these on the farm. A capon is raised quite large and is much more tender and juicey than your average chicken. Most people say this is the best chicken they have ever had. Line a cookie sheet with foil. Grease well. Mix first 5 ingredients well. Dredge wings in flour mixture, place on greased pan, then cover and refrigerate for at least 1 hour. Preheat oven to 425 degrees. Melt butter and mix in the hot pepper sauce, garlic powder, and black pepper. Dip wings in the sauce then place on prepared cookie sheet. Bake for 30 minutes, then turn wings and continue baking for another 30 minutes or until done. 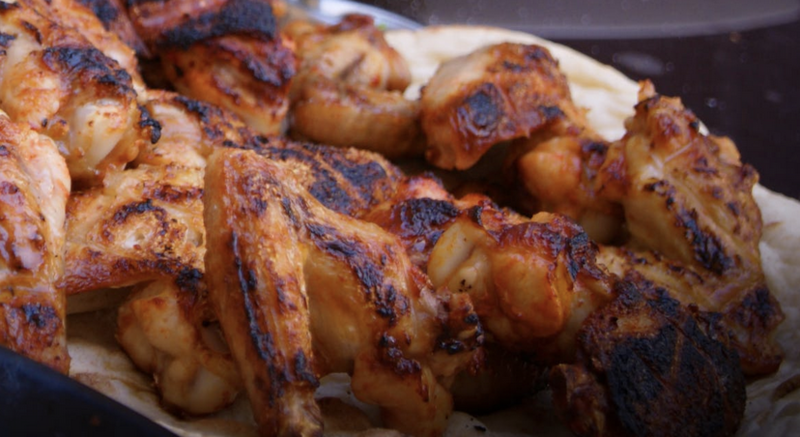 Wings should be crispy and delicious! IFC Distribution is Today (or Tomorrow in Ames)! This is being sent to everyone who ordered. Today is distribution at all our sites except Ames, which will be tomorrow. Our alternative pick up is Saturday from 9 am to noon at our Franklin Plaza site. That’s the same time as our Winter Holiday Market, which we hope you can attend (and bring a friend – it’s open to the public). For samples today at all sites, including Franklin, we’ll have gluten-free baked goods from Marmalade Sky, our newest producer. We’ll have lots of fresh produce and new items at our retail center at Franklin Plaza.. Thanks for your orders. See you later today or tomorrow in Ames or Saturday morning. If for some reason you need to call, use 515.450.6812. IFC Pick-up is This Week! Hi. If you are getting this by email, you placed an order for this week’s distribution. We had 250 members buy 2,558 different items from 87 different producers. Sales were about $17,500, which is 18% more than the same cycle last year. Nice. We truly appreciate your using the IFC for your local food needs. It helps so many people, and so we are deeply grateful. Please note that we’ll be having our Annual Winter Market from 9 am to noon on Saturday at our Franklin Avenue location. We’ll have a dozen producers in our space selling their products, plus a wide selection of products in our Retail Center. Locally-produced food and gifts, from fresh greens to cheese, meat to eggs, honey to beeswax candles. Non-members welcome, so bring your friends! Here’s info regarding pick up this week. 1. Specifics on times and locations for all our sites are available with this link and to the left. NOTE: IF YOU ARRIVE BEFORE THE SCHEDULED START TIME, OUR VOLUNTEERS WON’T BE READY. PLEASE PLAN ACCORDINGLY AND BE PATIENT. 3. Our alternative pick up time at our Franklin Avenue location will be from 9 am to noon on Saturday, Dec. 8. If we don’t see you Thursday, we’ll assume you are coming Saturday or have made other arrangements. 4. We accept EBT cards for payment ONLY AT OUR Franklin Plaza site. If you are an EBT member and are picking up at another location, please send an email to distribution@iowafood.coop so we can arrange for processing your payment. 5. It’s a GOOD IDEA to check to be sure your pick-up site is correct. You can access your invoice by logging in, going to the shopping tab, and click “view in-process invoice”. If it’s not right, send an email to distribution@iowafood.coop. Have you ever had gravy that’s so good that you want to eat it in a bowl with a spoon? This simple pot roast renders that kind of gravy – it’s rich, flavorful, and has a perfectly silky texture that stands up to anything you want to ladle it over. This roast is good enough for Sunday dinner with company and easy enough to make on a lazy afternoon with family. (Pictured with a round roast from Ebersole Cattle Company) Have you ever had gravy that's so good that you want to eat it in a bowl with a spoon? 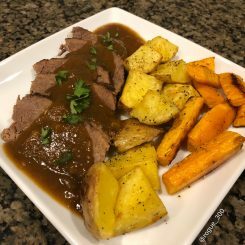 This simple pot roast renders that kind of gravy - it's rich, flavorful, and has a perfectly silky texture that stands up to anything you want to ladle it over. This roast is good enough for Sunday dinner with company and easy enough to make on a lazy afternoon with family. Generously sprinkle the roast with the salt, black pepper, and smoked paprika. Set aside. In a heavy Dutch or French oven, melt the ghee over medium-high heat. Add the onions and carrots to the pot and cook until browned on both sides. Remove to a clean plate. Place the roast in the pot and sear on each side for about 3 minutes - don't move it around so that you get a good, brown crust going. Remove to the plate with the vegetables. Pour the wine into the pot and scrape the brown bits off the bottom as the wine boils. Once the pot is deglazed, put the roast back in and place the vegetables on top. Pour in enough beef stock to come at least halfway up the roast. Place the herbs on top. Put the lid on the pot and move to the preheated oven. Roast for 3 1/2 to 4 hours, or until the meat is fork tender. Remove the roast to a plate and keep warm. If using fresh herbs, remove the herb sprigs from the pot and discard. Using an immersion blender, or carefully transferring the cooked vegetables and liquids to a blender, blend until smooth. If the gravy is thinner than you would prefer, mix 2 TB corn starch with 1/4 cup beef stock and pour into the gravy while bringing to a boil over medium-high heat and cooking until desired consistency. Slice the roast and serve topped with the pan gravy along side roasted or mashed potatoes, vegetables, and of course bread for sopping. Leftovers can be frozen by storing the beef and gravy separately - add a couple of TB of beef stock in with the meat to prevent it from drying out when reheated. 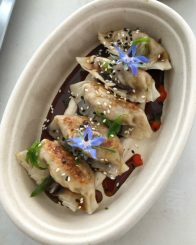 Check out their plant-based prepared foods made from local ingredients. Eating local doesn’t always mean you have to do the cooking! Their selection is full of diverse offerings + flavors, from handmade tortillas to dumplings to pancakes. Yep, pancakes. Get a chance to meet the farmers, makers, and food producers behind your favorite products. Know the artisans who make the gifts you give. Locally-produced food and gifts, from fresh greens to cheese, meat to eggs, honey to beeswax candles. Shop a large selection of products made, grown, or raised in Iowa! Invite your friends by sharing this event on Facebook. What is the Local Food Difference? 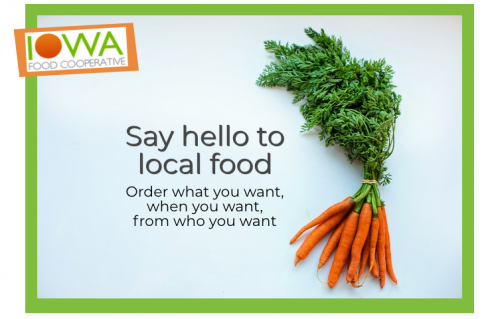 If this is your first time visiting our website you might be wondering, what is Iowa Food Coop? 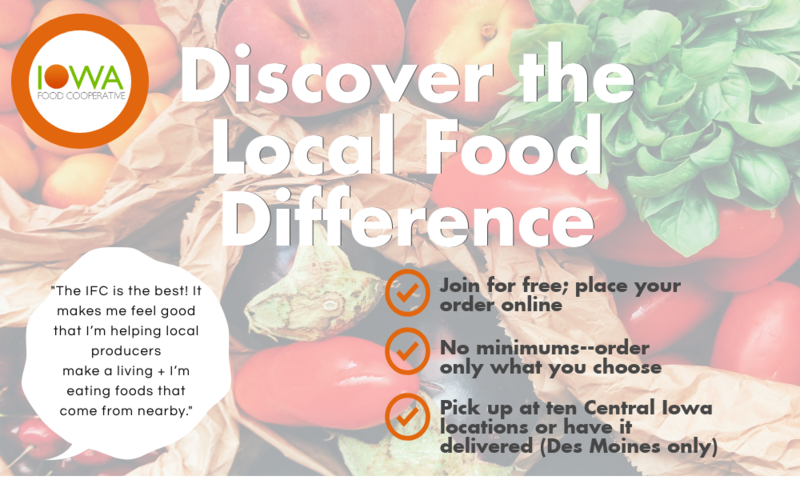 To put it simply: Iowa Food Coop is an online ordering system for Iowa produced food. Our members have access to over 1,500 Iowa produced products, which they order on a bi-weekly schedule. There are a lot of special things about Iowa Food Coop besides our selection of Iowa produced products. Here are just a few more things that set us apart. Logon to iowafood.coop/shop and browse our selection. You can sort by producers or by item. You’ll find that we sell all of the staple items you need like bread, eggs, milk, cream, and meat. We also sell specialty items like Iowa produced maple syrup, soap, hummus, kombucha, dog treats, baby food, and the list goes on and on. Our producers are expected to share their growing practices and ingredients with you so you know exactly what is in the food you’re eating. Visit our producer profiles and pick one out. You can read about their business and practices, and if they currently have items for sale you can read more about their individual products. We’re not a store and we don’t have inventory. When our consumer members place an order online they are ordering directly from the producer. When the cart closes the producer gets a list of everything that was ordered that cycle and brings it to our Des Moines location the day before or morning of distribution. Since we only receive what was ordered we don’t have excess food to throw away. 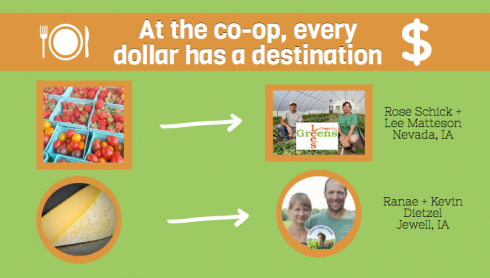 When you shop at Iowa Food Coop you are not supporting corporate interests. The money you spend goes directly into the pockets of our producers and into making IFC a great alternative to the conventional food system. You can feel great about the money you spend at IFC. Several IFC members buy at least half of the food they eat through us. By ordering on IFC’s bi-weekly schedule they cut their trips to the grocery store down significantly and know more about where their food comes from. No longer tempted by grocery aisles full of cookies and chips, they often find that their diets improve dramatically. And this is not a fad diet. An #iowavore diet (mostly local, Iowa food diet) is a way of eating that not only makes the consumer healthier, but helps local farmers and our local economy. Iowa Food Coop is a year-round option for eating local. Just because the farmer’s market season has ended or your CSA is done doesn’t mean you have to stop eating local. Purchase meat, greens, milk, vegetables and more through IFC all winter long. Step One: Check to see if the cart is open. You’ll notice in the left sidebar of this site we list our Upcoming Order Cycles. Check here to see when the cart opens or closes. You can also check our Facebook Events page and subscribe to be notified of upcoming order cycles. When you become a member at this page you’ll be signed up for our cart-is-open reminder emails. Your first six months as a member are free, which gives you a chance to fall in love with IFC! Step Two: If the cart is open, fill up that basket! Go to iowafood.coop/shop and login (you’ll get your login information when you become a member in Step 1). On the member panel page you’ll see your “Basket Status.” Click open a shopping basket. Select your delivery type and pick-up location. Once you’re in, click shopping and browse our list of products by category, producer, or search for the item you want! Step Three: Pick-up the following Thursday! Whatever is in your cart on Sunday night is ordered. You can set up payment online or you can pay when you come to pick-up on Thursday. Here’s a list of our convenient pick-up locations. Find the location closest to you and become a regular at Thursday pick-ups! We love to see what are members are eating and enjoying. 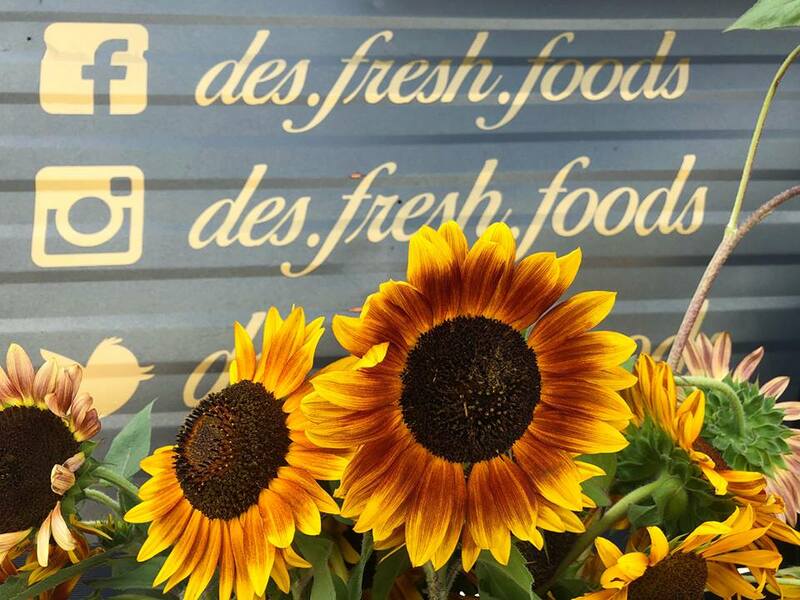 Share your photos with us on Facebook and Instagram using the #iowafoodcoop hashtags. So what are you waiting for? Come join today! This is being sent to everyone who ordered. Today is distribution at all our sites except Ames, which will be tomorrow. Our alternative pick up is also tomorrow (Wednesday) from 10:30 am to noon at our Franklin Plaza site. Also, we will have Brussels sprouts, carrots, head lettuce, chestnuts, cabbage, and eggs for sale in our Franklin Avenue On-Site retail area, as well as tons of fall decor and winter squash. All are welcome, so bring a friend. Thanks for your orders. See you later today or tomorrow. If for some reason you need to call, use 515.450.6812. IFC Pick-up is This Week! Note T-Giving Week Schedule Changes! We had 210 members buy 2,428 different items from 87 different producers. Sales were about $15,000, which is about 10% above same cycle sales last year. That’s our goal, so we did well. Below is info regarding distribution this week. Please know we truly appreciate your using the IFC for your local food needs. It helps so many people, and so we are deeply grateful. 1. If you are picking up at Franklin Plaza, please check out products available for purchase in our Retail Center. There’s good stuff you can add to your online orders. 2. Pick up times at all sites are the same, but we’ve moved distribution to tomorrow (Tuesday). Ames pick-up will be Wednesday from 4:30 to 5:30 pm. Our alternative pick-up for Franklin Avenue customers will be Wednesday morning from 10:30 to noon. 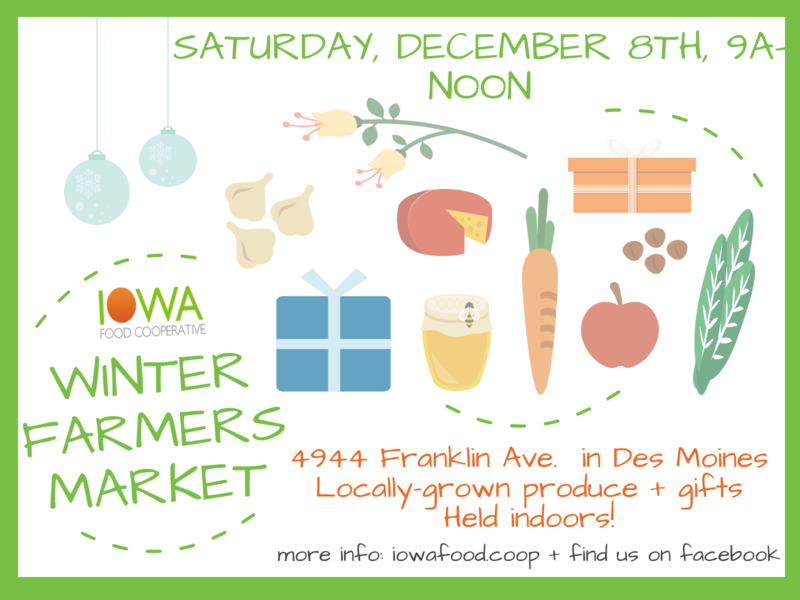 If you have any questions, please email us at distribution@iowafood.coop. 3. We accept EBT cards for payment ONLY AT OUR Franklin Plaza site. If you are an EBT member and are picking up at another location, please send an email to distribution@iowafood.coop so we can arrange for processing your payment. 4. It’s a GOOD IDEA to check to be sure your pick-up site is correct. You can access your invoice by logging in, going to the shopping tab, and click “view in-process invoice”. If it’s not right, send an email to distribution@iowafood.coop.